Christopher Barzak’s new novel is wonderfully heartfelt and elegantly mysterious, interweaving the real and the uncanny into a compelling maze of interconnections. The deeper you get into the lives of these disparate, intertwined characters, the more complex and moving and surprising their connections become. In this follow-up to his notable debut, One for Sorrow, Barzak offers an otherworldly novel made up of linked short stories set in contemporary Japan. Barzak’s varied players spin their stories of love, grief, and growing up in first-person narratives that artfully collide with each other to stunning emotional effect. In one narrative thread, a teenage boy lost in Tokyo is led home by an ethereal girl in a fox costume; he later discovers she is dead. The childhood best friend of the fox girl is a casualty of her planned group suicide, but not in the way she anticipates. The author finds rich territory in situating his characters in places steeped in personal loss and letting them fumble toward acceptance of their own frailties. 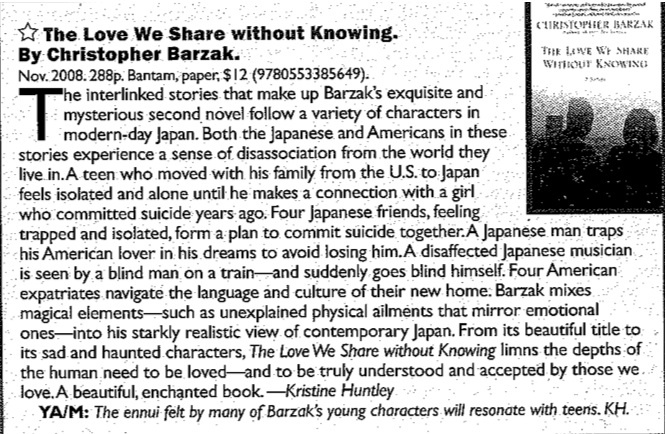 From the frantic streets of Tokyo to the surreal silence of rural Japan, Christopher Barzak spins the familiar yarn of the everyday world into a magical universe. Following in the themes of his stunning debut, One for Sorrow, Barzak once again tackles loneliness and longing, and elegantly blurs the divide between the living and the dead. 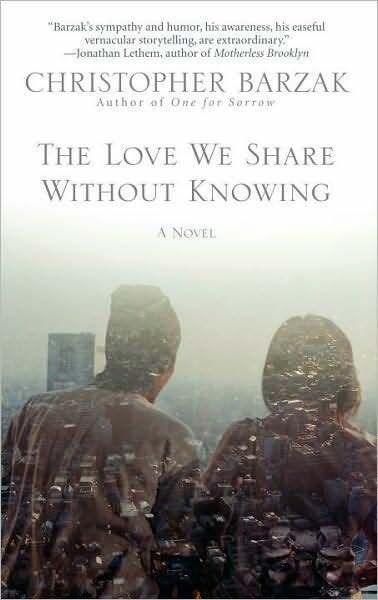 The Love We Share Without Knowing is haunting, strange, and utterly surprising from the first page to the last. On a train filled with quietly sleeping passengers, a young man’s life is forever altered when he is miraculously seen by a blind man. In a quiet town an American teacher who has lost her Japanese lover to death begins to lose her own self. On a remote road amid fallow rice fields, four young friends carefully take their own lives—and in that moment they become almost as one. In a small village a disaffected American teenager stranded in a strange land discovers compassion after an encounter with an enigmatic red fox, and in Tokyo a girl named Love learns the deepest lessons about its true meaning from a coma patient lost in dreams of an affair gone wrong. From the neon colors of Tokyo, with its game centers and karaoke bars, to the bamboo groves and hidden shrines of the countryside, these souls and others mingle, revealing a profound tale of connection—uncovering the love we share without knowing. Exquisitely perceptive and deeply affecting, Barzak’s artful storytelling deftly illuminates the inner lives of those attempting to find—or lose—themselves in an often incomprehensible world.